Australia's very own burger, made from rich, lean, ethically sourced kangaroo meat. But why do 'roo burgers only pop up just before Australia Day, as if that's the only time we bother to eat anything native to Australia? The Roo Burgers Forever movement (started right here and now) demands that they be around all year, and not just Australia Day. At Sydney's The Dip, chef/owner Andrew ''Lev Dawg'' Levins wrangles kangaroo meat and fresh sage into a patty and serves it in a burger bun with dill mayo, rocket and pickled beetroot. ''Because the meat is so lean, I cut it with macadamia nuts to give it some fat content and nuttiness,'' Levins says. His tip? Form the meat into patties and put them straight on the grill rather than leaving them exposed to air, or the meat may oxidise and change colour. Because it makes sense to use what we have. Kangaroo is a great natural resource, with better environmental credentials than cattle or sheep. The meat has about 2 per cent fat, is high in zinc and iron, and tastes clean, rich and not overly gamey. Too easy. Add lettuce, tomato, cheese, bacon, even a fried egg, but note the Constitution stipulates pickled beetroot is mandatory - or citizenship will be revoked. Gourmet Game kangaroo meat from Macro Meats is in the meat section of Coles, Woolworths, IGA, BiLo and other major supermarkets. 1. To make the beetroot relish, whiz the pickled beetroot with olive oil, sea salt and pepper, and set aside. 2. Squeeze any excess juices from the onion and mix the onion with the meat, cumin, oregano, sea salt and pepper, using your hands. Form into four round burgers, using egg rings to help with the shape. 3. Brush with olive oil and pan-fry or grill for four minutes on one side. Turn and finish the cooking until done to your liking, but it's best served medium rare. 4. Toast the buns lightly, and spread each half with aioli or mayonnaise (add a spicy fruit chutney as well if you like). 5. 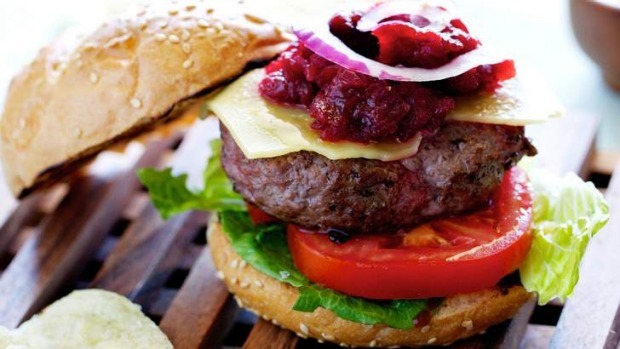 Top the base bun with lettuce leaf, tomato, meat, cheese and beetroot relish. Top with remaining half of the bun, secure with a wooden cocktail spear and serve hot. Correction: A previous version of this article mentioned that kangaroo burgers were available at the Melbourne outpost of Perth burger chain Jus Burgers. The Melbourne store has closed down.